At the designated meeting point in Dijon from 16:00hrs, an air-conditioned bus will transfer you to the barge. You are welcomed on board with a “Kir Royal” by the crew. An unforgettable cruise is about to begin in Burgundy. Your Chef will provide you with an introduction to regional specialties and wines with great names, Chambertin, Corton, Montrachet, etc. The bar and sun deck provide a warm atmosphere to share drinks with fellow passengers. Naturally, all drinks served on board are “all inclusive” and available around the clock. Dinner aboard. Your dinner includes 4 courses: starter, main course, choice of 3 local cheeses and dessert, accompanied by Burgundy wines from village to première cru quality. While you have breakfast the barge leaves the Port of Vandenesse and begins to pass through the first locks (there is a total of 45 locks during the week’s cruise) destination of Pont d’Ouche, the navigation is very interesting. A wonderful occasion for you to enjoy the countryside as the barge glides along the canal. Arriving in the village of Crugey at midday, the chef will enchant you with a typical Burgundy buffet. After the lunch time break the barge continues the voyage to the tempo of the canal locks to Pont d’Ouche. When your hotel barge is moored up, you will be driven to Chateauneuf en Auxois which you passed by today. Walk into this medieval village with its cafes, antique and curiosity shops along the picturesque streets. There is also a fantastic view over the Auxois plains, with lakes and the distant Morvan hills. Dinner aboard. Your dinner includes 4 courses: starter, main course, choice of 3 local cheeses and dessert, accompanied by Burgundy wines from village to première cru. Full day excursion driven in an air-condtioned mini-van to the town Beaune. lunch is offered in a traditional wine cellar restaurant where you can eat the best garlic snails and coq au vin in Burgundy with fine wines from the Côtes de Beaune. In the afternoon, there is plenty of time to visit the famous Hospices de Beaune built in 1443 and stroll along cobbled streets with boutiques of all kinds. The return to the barge takes you through the “Hautes Côtes” vineyards and past the source of the river Ouche. Today the barge cruise will take you into the magnificent Valley of the Ouche, a journey back in time passing through a unique landscape as the canal twists through the narrow valley. You will have many occasions to be sportive with walking and cycling along the tow-path. The barge will pass through the villages of La Buissière sur Ouche and Saint Victor to Gissey sur Ouche. There the barge is moored in a hidden spot, beside the river Ouche and a Gallo Roman bridge, one of the most photographed or painted views of the region. As the valley slowly unfolds, the barge passes through the charming villages of Saint Marie sur Ouche and Pont de Pany. The barge heads on to the village of Fleurey sur Ouche. There are many opportunities to use the mountain bikes and explore the surroundings or take a short walk to a nearby café. 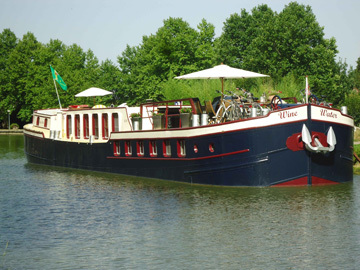 Once moored in Fleurey sur Ouche there are possibilities to discover more about the region, from Gallo-Roman ruins to feudal castles with dramatic histories. Today the passengers tell the guide where they would like to go: For example la Route des Grand Crus, Clos Vougeot or Nuit Saint Georges. On returning to the barge, your dinner will delight you with carefully prepared dishes and selected wines. Cruise from Fleurey sur Ouche to the city of Dijon. Visit to the morning market in the old city centre. Today you will make an excursion to the Dijon market and to visit the historical city center.Late morning return to the barge to continue the last part of the cruise arriving in the pretty port of Dijon, at only a 10 minutes walk from the Dijon city center. Farewell diner in a nearby gastronome restaurant with Captain. After breakfast, passengers will disembark at 10:00 am and be transferred to Dijon railway station (or another destination agreed with the Captain).